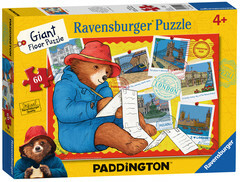 When the much loved Paddington returned to our screens in the 2014 movie the kids were engrossed in it as was i, we loved it and watched it over and over again, often having a giggle at his antics when something random happened that reminded us of the movie and the recent release of Paddington 2 has reignited the love for the little brown bear. We were given the opportunity to review this 60 piece giant floor puzzle from Ravensburger, suitable for ages 4+, which we were really happy about and couldn't wait to receive it. 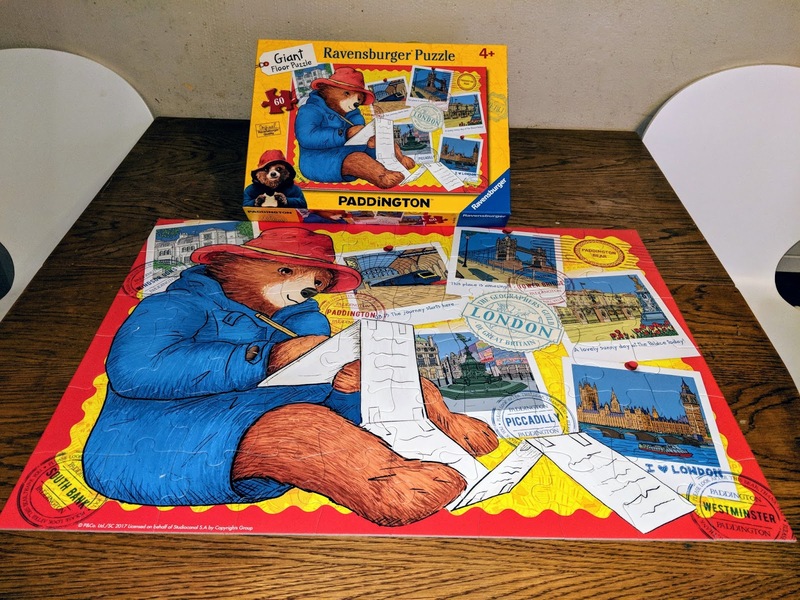 I was quite surprised that it was the eldest that couldn't wait to get the puzzle out of the box as it is usually the youngest who loves games and puzzles while the eldest is favouring technology more and more but i think the love for Paddington even won out over Minecarft! It was great to see them sit and work together on this and although it states age 4+ it didn't seem to young or easy for my 6&8 year old. It states Giant and measures approx 19 x 27 inches when complete so not too big but the pieces are large enough for smaller hands to pick up and manipulate easily, we did the puzzle both on the floor and on the dining table, for me table top is easier so the kids are not climbing over each other to fit the pieces, which inevitably ends up in arguements. The puzzle was well made and strong so i think the pieces will withstand many times of making up the puzzle which is great as with so many puzzles we have had in the past the edges fray or pieces break with young hands trying to force pieces into the wrong place! I work in a preschool setting and can see this is a great puzzle for kids of all ages as it makes an ideal activity for parents/ care givers to sit and do with the younger kids and is ideal for them to do alone as they get older practicing problem solving and developing fine motor skills, it is bright and colourful so appealing to children and gives plenty of opportunity for discovery and discussion. 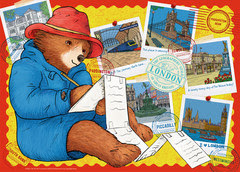 The image gave us much to discuss as it features places of interest around London, somewhere we have talked of going since watching the first movie, although i am slightly concerned they are going to expect to find a Paddington when we visit!